Stookeennalackareha is the 886th highest place in Ireland. Stookeennalackareha was the last top of a five-summit circular walk which also included Knockowen, Cushnaficulla, Knockeirky and Glenkeel Top (see previous comments on this walk). Walked down Knockowen and its cloudy top and my last target of the day appeared below me, bathed in a shower of sunbeams that were peering out of the clouds, proudly facing the massive outline of Lackabane. The descent is not very steep from this side, and the soft and relatively dry ground made it easy for the knees. There is a flat, boggy area before the final 3-5 minute pull-up to the top. There is a sheer drop on the W side, so care would be required on a windy day. 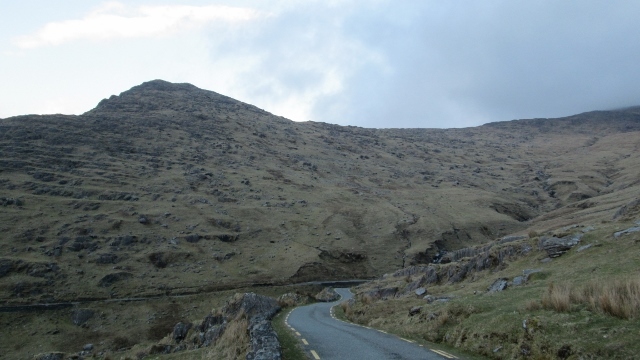 The views are rewarding, with the triangular shapes of Knockastumpa, Knockatee and Knockanoughanish to the N, Kenmare River and the Dunkerron to the NW, Glanmore Lough, Tooth Mountain and Lackabane to the W/SW, and the W slopes of Knockowen to the E.